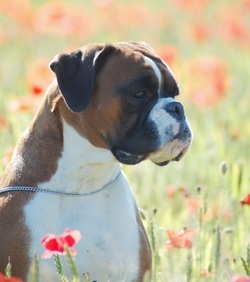 ​This was the 2nd portrait commissioned by the owner to match her first booked portrait of another Boxer dog named Poppy (see the bottom of the page) The stance was chosen so that they would 'mirror' each other when hung on the wall. As you can see from the reference photo, the eyes are rather dark minimising the detail I needed, however I was able to lighten up the eyes a little more and added the missing catchlights as well as lightening the rest of the face and also tone down the shadows in the white fur which was over exposed on the photograph - this all helped to balance out the image and the final Artwork. cant wait to get her framed and hanging in pride of place x"
Here is the last portrait that I was asked to produce for the owner. This was also completed in Coloured pencils. Click to see progress on Poppy.